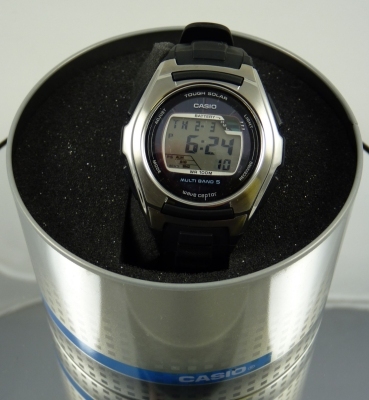 The Waveceptor WVM120 is a water resistant watch designed to be of use to a wide variety of users. 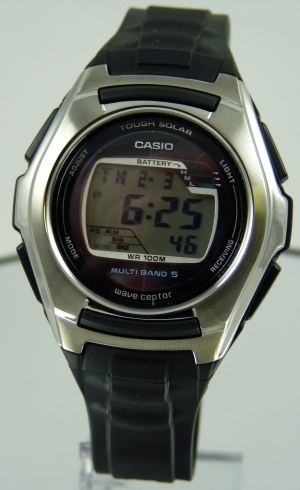 The watch uses solar power to keep the internal rechargeable battery charged. 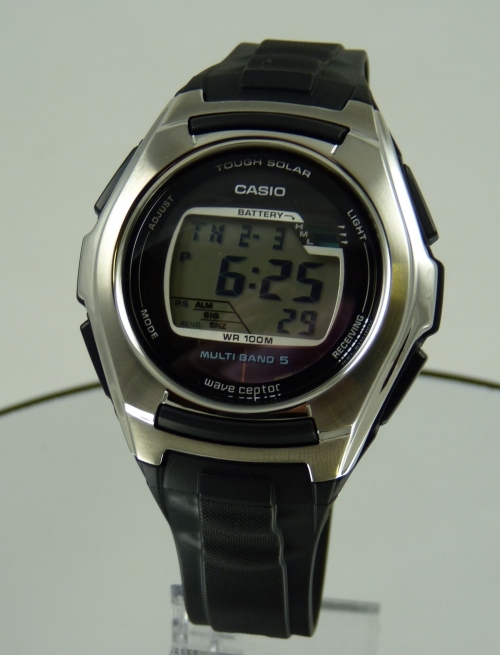 The Waveceptor WVM120 by Casio comprises a tough, water resistant digital watch face attached to a resin band with a traditional buckle fastening. The watch has many functions that allow it to be useful to everyone, from a businessman to a diver. The watch has the ability for you to set up to 4 daily alarms and a snooze alarm. 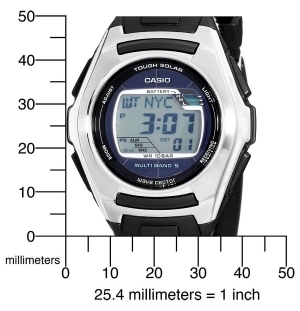 The watch has a world time function and it also includes a stopwatch function which can record elapsed time, lap time, split time and 1st-2nd place times, and is also water resistant to 100M. The watch has a built in calendar and features afterglow technology to allow you to clearly read the time even when its dark. 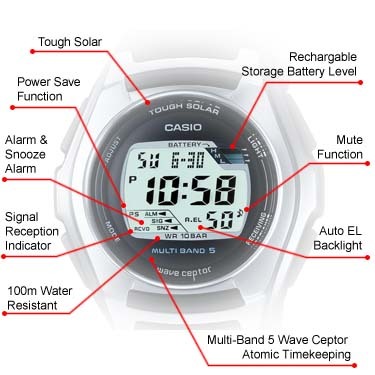 This Solar Atomic watch with Multi-Band 5 functionality has the ability to receive signals from up to 5 towers located worldwide. 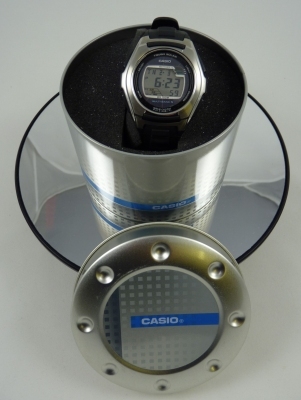 Complete with full instruction and is packaged in original Casio presentation tin case. 54.0 x 44.8 x 13.3mm / 46g. 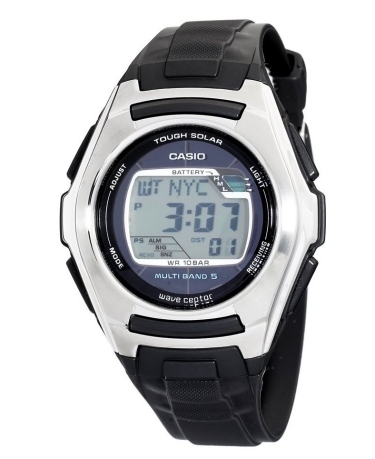 This superb Casio Sports watch is both stylish and multi-functional with just about every conceivable feature. This Watch retails for over £100 in many high street retailers. Please note: All my items are either ex-display only NOT customer returns, direct from major UK retailers and as such will have been opened to check all items are correct and working. I try to describe the items as best as possible, if you have any questions about any specific item please e-mail before bidding and I will be happy to provide any additional information I can. Buy from a Trusted UK Seller, all my watches are In Stock Now and ready for Immediate Dispatch, please check my feedback. as described, very pleased, might keep it myself, was a present! Brilliant item, very pleased, very quick delivery. Quick delivery watch exactly as described good bayer! Thanks! Please conduct ALL communications with me (before or after your purchase) ONLY through the eBay email system (which I check very regularly) and NOT through my hotmail account (which I only check occasionally). Please also note I only leave feedback once feedback has been left by the buyer, so please don’t ask for otherwise. Lastly I ONLY post internationally with prior agreement WITHOUT EXCEPTION.